Today I’m sharing our FAVORITE classic chocolate cake recipe of all time. This amazing Chocolate Cake from scratch is our go-to recipe, and always gets rave reviews! 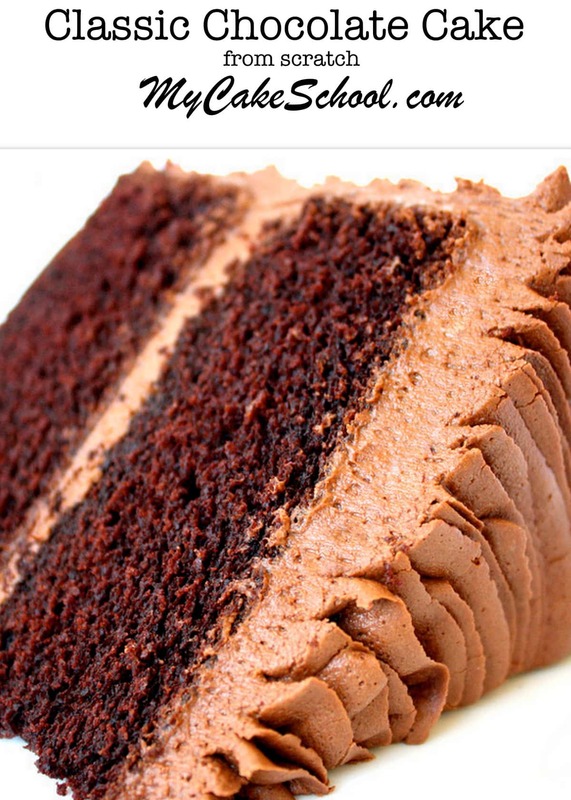 It is rich, moist, and absolutely delicious! For years, we searched for the perfect chocolate cake recipe, but were never satisfied. They were either too dry, too crumbly, too soft, not chocolatey enough, and so on. When we finally tried this cake, we knew that our search was over! It’s super moist, has the perfect amount of chocolate, and is sturdy enough to hold up to fondant if your design calls for it. As a side note, this chocolate cake recipe (along with several of our other popular recipes) uses the Reverse Creaming Method of Mixing. What is the Reverse Creaming Method of Mixing? This is a popular method for creating a slightly denser, more melt-in-your-mouth texture. If you are new to this method, you may be interested in watching our free video here: The Reverse Creaming Method of Mixing. If you would rather not go the Reverse Creaming Method route, don’t worry! We’ve also put this Classic Chocolate Cake scratch recipe into the standard Conventional Method of Mixing as well. This doctored cake mix recipe is out of this world, and nobody would ever guess that it started with a mix. Sometimes you just need a quick and easy doctored cake mix recipe and this is one of our favorites. 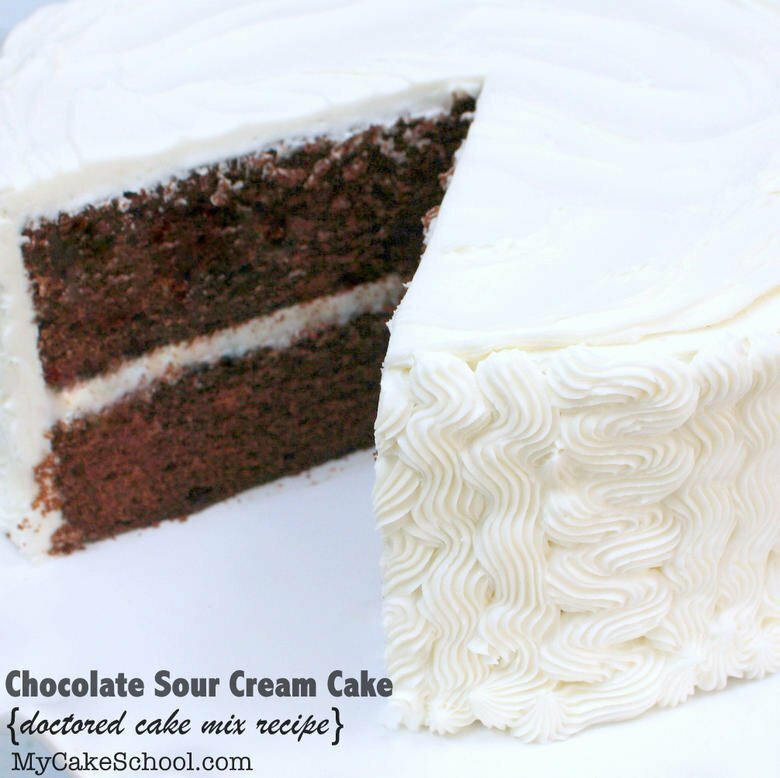 As we mentioned earlier in our post, you can make this same scratch Classic Chocolate Cake recipe but using the conventional method of mixing instead of the reverse creaming method. 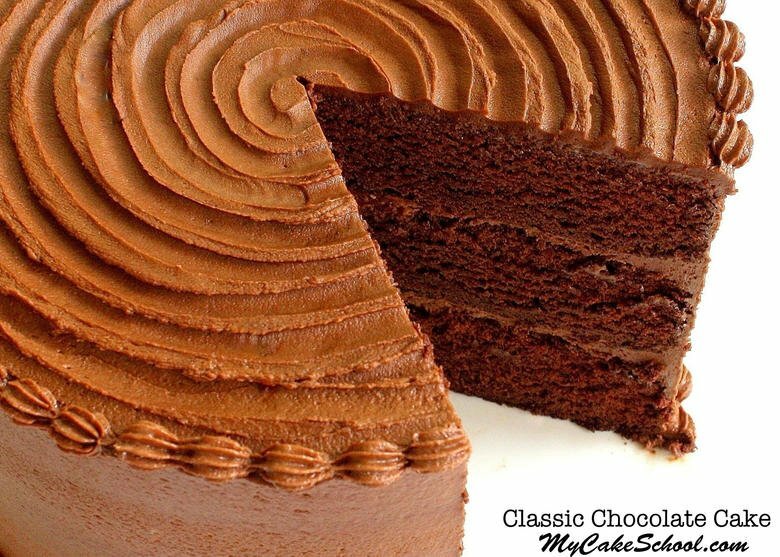 * We have another amazing chocolate cake recipe for you to keep in your Recipe File of Favorites! 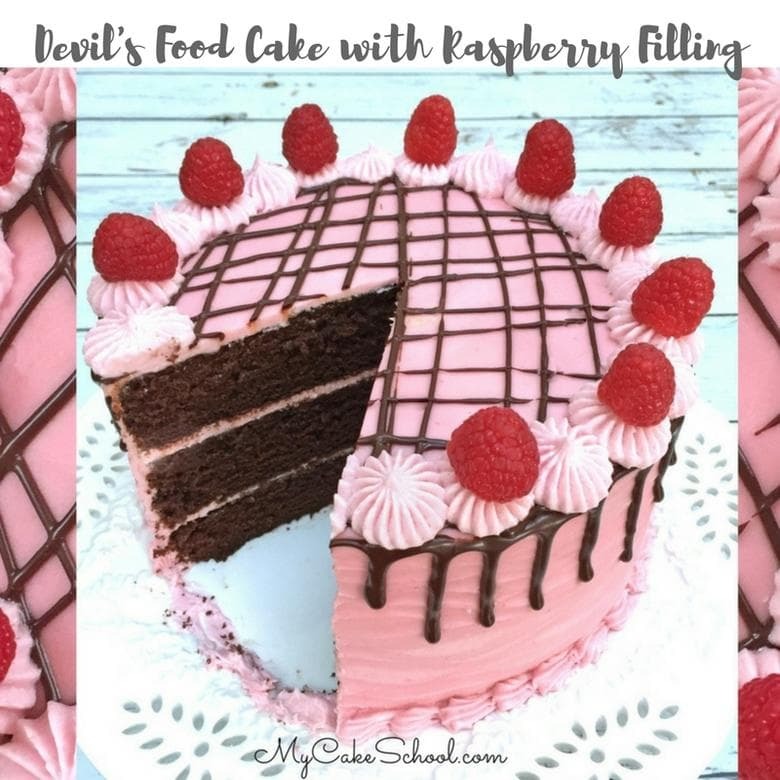 Hop over for a fantastic Devil’s Food Cake recipe! Much like our classic chocolate cake, this moist chocolate recipe also has a wonderful melt-in-your-mouth quality: Devil’s Food Cake Recipe from Scratch . There’s no such thing as too many chocolate cake recipes is there? Thanks for stopping by! 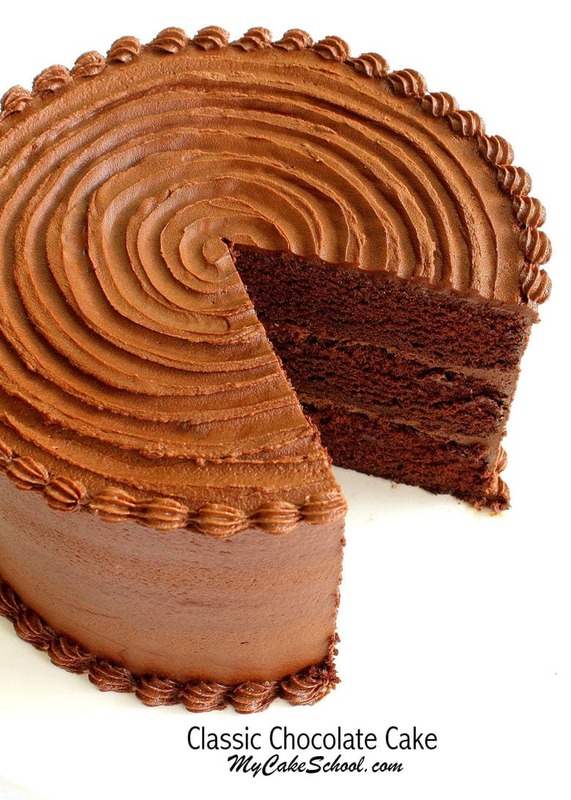 It seems like the perfect day to make a chocolate cake. We hope that you enjoy the recipe! Don’t miss our full collection of the BEST Cake and Frosting Recipes in our Recipes Section! If you’re interested in cake decorating as well, make sure to check out our Free Cake Tutorials Section where you can select tutorials by category. This moist, decadent classic chocolate cake from scratch is the BEST! This cake recipe uses the Reverse Creaming Method of mixing, creating an extra moist cake with a tight crumb and velvety texture. In a mixing bowl, add the dry ingredients: sugar, flour, cocoa, baking soda, baking powder, and salt. Whisk for 1 minute to blend. Add softened butter a few pieces at a time while the mixer is on low speed. Mix until the dry ingredients look like coarse sand and the dry ingredients are moistened. Scrape the bottom and sides of the bowl. In a separate bowl whisk the eggs, milk , oil and vanilla until blended. Method is important when using the Reverse Creaming Method. With the mixer on low speed, SLOWLY add approximately 1/2 of the egg mixture to the dry ingredients. Increase the speed to medium and mix for 1 1/2 minutes at medium speed. Don't mix above medium speed. Scrape the bottom and sides of bowl. Add the remaining egg mixture in 2 pourings, beating for 20 seconds after each pour. Scrape the sides and bottom of bowl. Slowly add the cup of hot coffee and mix another 30 seconds until blended. The batter will be very runny. Don't worry! Pour into 3 prepared 8" pans and bake at 350 degrees for 25 to 30 minutes or until the center of the cake springs back to the touch and a toothpick comes out clean. Cool the cakes 10 minutes on a rack and then turn out of the pans. *Yields approx 9 cups of batter. CAKE TIP: To increase moistness of layers, cool another 10 minutes and while still very warm double wrap the individual layers in plastic wrap and freeze for up to a week. To freeze longer, use plastic wrap then put into a freezer bag or aluminum foil and freeze for up to 2 months. If you need the cake right away, even freezing for a couple of hours will increase the moistness. Hi there! Just a clarification as I overlooked it last time. I have to bake using bain marie method, right? Sorry I got confused towels soaked in water. I’ll opt to reduce the recipe by 1/3 and use the 8” x 4” pan. Thank you! Hi Kay, No, the cake is not baked using the bain marie method. Heather’s recommendation to use damp tea towels (wet them then squeeze out the excess water) will give you an insulating effect, allowing the sides and center of the cake to bake at the same rate. The tea towel would be folded to fit around the sides of your cake pans. You could also use Wilton Bake Even Strips. Here is a link to a video show how to use Wilton strips. Thank you BeBe for the clarification. I would have made a huge disaster! I’ve watched the video and it’s very helpful. I made your chocolate marble cake using 2 different depths (same pan size), and they came out in different sizes. Using soaked towels would have made a difference. Thank you for all the help and wonderful recipes! Can all of your recipes be made with the conventional method? I had trouble with sunken middle and weird texture when I used reverse creaming. I’m sorry you had a problem with reverse creaming. Yes, if you would like to make the recipes using the conventional method, I suggest that you rewrite the recipe using that mixing method. After you write it out, count the ingredients to make sure nothing is left out. Hope all goes well the next time you bake the cake. Hello Melissa & Bebe. Would the Classic Chocolate cake recipe hold well under fondant? Hi Wally, Yes, it will hold up under fondant. Thank you for the recipe. I made this cake yesterday for my sons birthday this weekend. The laayers did not rise alot so i have 3 very flat cakes. I used the reverse method. Hi Reshma, I am sorry that you had a problem. There are several possible causes. Your baking powder or baking soda may be out of date, when you add 1/2 of the liquid, it needs to be added slowly, the batter was mixed at too high a speed or for too long. You might like to use the conventional mixing method rather than the reverse creaming method. Click on the link below for the same recipe but written using the conventional method. Hi. My new oven has two fans and quite powerful. Would it be ok if I reduce the temperature to 325? Hi Sanaz, I think that would be fine, just keep an eye on your cake. Reducing the temperature usually causes the bake time to be a bit longer, unless your new oven is baking hotter and faster than your old one. Hope all goes well. Hi Pinky, Yes, ganache frosting would be good on this cake. I have a question about the cocoa powder you use. Is it the natural unsweetened cocoa powder, or dutch processed? Have you ever tried it with dutch processed? I like the richer chocolate flavor of the dutch, but it’s more alkaline so I find I sometimes have to make adjustments to the baking powder or soda. Thank you. Hi Jeanne, We have never tried the recipe with Dutch processed cocoa. Our leavening is mostly baking soda with some baking powder. Here is a link (below) that is a good explanation to the two cocoas if you would like to experiment. I would love to know how it goes if you use Dutch processed. Hi can buttermilk be used in place of regular milk? I can’t stand coffee flavor. What should I replace the coffee with other than hot water? You should replace with hot water.